Cathcart spent a highly successful season on loan at Argyle from Manchester United, which culminated in him winning the Young Player of the Year award for 2008-09 at Home Park. The Northern Irish central defender joined United as a trainee in 2005 after playing for Glengormley High School, and won the Northern Ireland Youth Player of the Year award that same year. In 2007 he was made captain of United's youth team and skippered the side that reached the FA Youth Cup final, playing alongside future Pilgrims James Chester and Richard Eckersley, although Cathcart missed both legs of the final tie. In August 2007 he was dispatched on a season-long loan to United's feeder club, Royal Antwerp, which was followed by his season at Home Park. Twelve games in a three-month loan spell at Watford followed in the Autumn of 2009 and a year later he won the first of 16 full international caps (as of March 2015) for Northern Ireland, adding to an impressive total of 55 caps at all age levels from under-16 to under-21. In August 2010 Cathcart moved to Blackpool on a three-year deal for an undisclosed fee, making his debut on the first day of Blackpool's first season in the Premier League. His first top-flight goal came in January 2011, a powerful header against his first club, Manchester United. Having taken up the option of a fourth year, he accrued 117 games in tangerine, but left Bloomfield Road when his contract expired, and in June 2014 moved to Watford on a two-year deal. 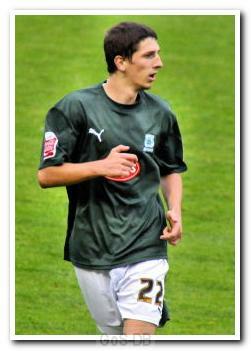 Craig Cathcart is arguably one of Argyle's best ever loan signings. Cathcart arrived in 2008 on a season-long loan from Manchester United and he was just as good, if not better, as the Argyle fans had hoped for. Strong but also intelligent and composed, Craig played the majority of games that season and even won Young Player of the Season before returning to Manchester.